When asked about specific news habits on each social site, users demonstrate some common tendencies as well as distinctions in how they use the sites. To some degree, this can be expected: The two services have different sets of technical features (Twitter has the live-streaming app Periscope, while Facebook has Instant Articles), and distinct cultures have arisen among their users. The nature of the differences revealed here clarifies the role each service plays in the news landscape. One of the areas of greatest difference is in the use of each platform for breaking news. Nearly six-in-ten Twitter news users (59%) use the site to keep up with a news event as it is happening, which is almost double the rate among Facebook news users (31% – a number that is on par with the percentage who did so in 2013). Facebook news users under 35 show somewhat more inclination than those 35 and older to use the platform for breaking news (37% vs. 27%), a difference that does not emerge on Twitter. 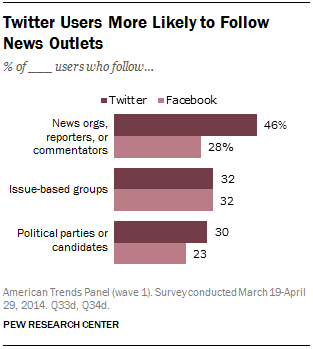 Another area of difference is in the mix of news topics seen on each platform. 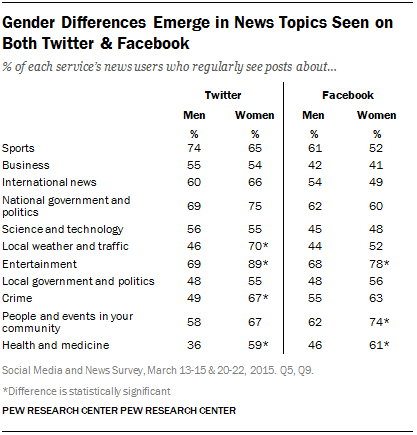 Twitter news users overall see a somewhat greater mix of topics. Roughly two-in-three Twitter news users (67%) report regularly seeing at least six of the 11 news topics asked about, compared with 57% of Facebook news users. 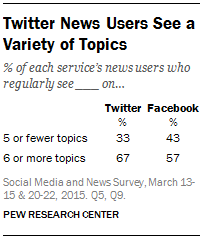 Nearly all of the topics asked about are seen by at least half of news users on each platform. But there are four topics that Twitter news users report seeing at higher rates than Facebook news users: sports (70% vs. 55%), business (55% vs. 42%), international news (63% vs. 51%) and national government and politics (72% vs. 61%). 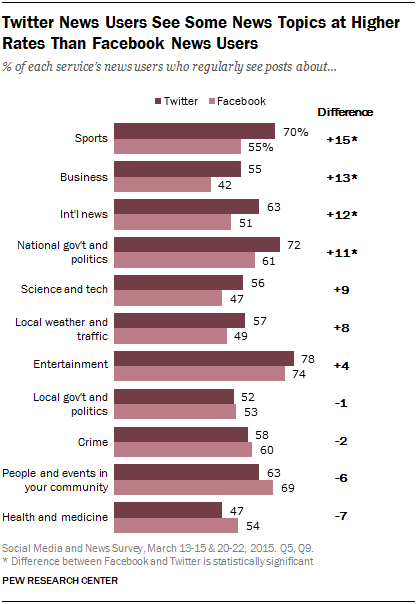 Twitter and Facebook news users are roughly on par with each other for the remaining seven topics: science and technology, local weather and traffic, entertainment, local government, crime, people and events in your community, and health and medicine. While most demographic groups see the various topics on each site at roughly the same rate, one demographic that stands out is gender.1 On Facebook, women are more likely than men to regularly see stories about entertainment, people and events in your community, and health, while on Twitter, women are more likely to see posts about entertainment, weather and traffic, crime, and health – a finding that echoes past research into differences between men and women in news consumption. There is no topic across the two sites that male news users reported getting at significantly higher rates. 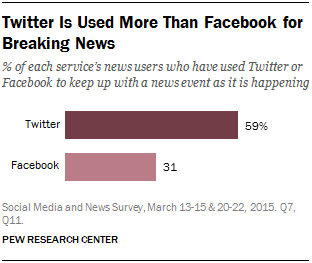 One area of commonality across the two sets of news users is the portion that tends to post about news. 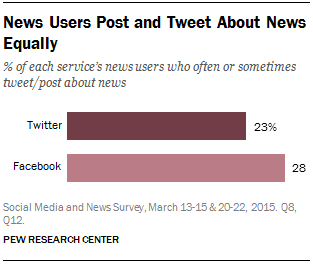 Roughly a quarter of both Facebook (28%) and Twitter (23%) news users at least sometimes post or tweet about news. On both sites, news users with household income under $75,000 are more likely to post about news than those in higher-income households. One-third of Facebook news users with household income of less than $75,000 a year post about news on the site at least sometimes, compared with 22% of those with higher household income. On Twitter the figures are 34% and 13%. Also, on Twitter, 18-34-year-old news users are about twice as likely to tweet about news sometimes as users 35 and over (26% vs. 12%) and non-white Twitter news users are more likely to tweet about news at least sometimes (36%) than non-Hispanic whites (15%) – differences that did not emerge among Facebook news users. There are a number of ways to ask social media users about how they engage with news on these sites, particularly when it comes to the activity of posting or tweeting, and the academic community is still learning how audiences respond to differently worded questions on this topic. In 2013, for example, Pew Research Center asked a series of questions about news-related activities on Facebook (including discussing, commenting on and posting news), and the responses there suggest a somewhat different interpretation of posting about news than responses to the question in this survey. In that study we found that 43% of Facebook news users said they at least sometimes post or share links about news stories on the site – a larger share than indicated here (28%). Posting about news may have indicated to respondents a higher and more involved level of activity than posting or sharing links about news stories. The larger takeaway from this survey’s findings, then, is the degree to which responses were similar across the two sites. In both cases, more than two-thirds indicated they had posted about news at least at some point in their use of the site. 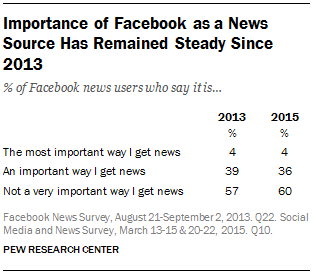 The level of importance of Facebook as a news source has remained about the same since 2013, when 39% said it was an important way of keeping up with the news and 4% said it was the most important way. While a greater share of the social network’s users get news there than did so two years ago, its importance as a news source to those news users has not changed. 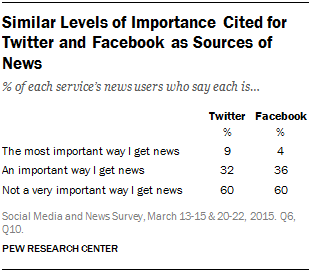 These data reveal, though, that on both social sites, younger users place greater importance on it for news. Nearly half (49%) of Twitter news users under 35 years of age say the site is the most important or an important way they get news, compared with 31% of those 35 years of age and over. This same relationship is true when it comes to Facebook (49% vs. 34%). This reinforces findings from another recent report by Pew Research, which found that Facebook was relied on as a source for political news among Millennials more than any other news source, and at a far higher rate than both Gen Xers and Baby Boomers. Facebook users (not just news users) are more likely than Twitter users to directly engage with political content on the site through posts, comments and likes. 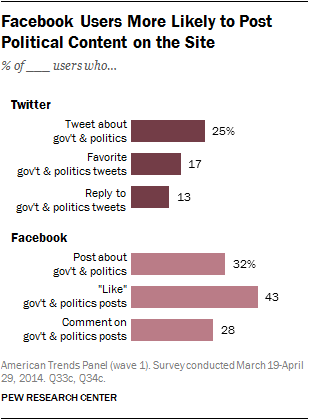 About a third (32%) of Facebook users post about politics and government, compared with a quarter (25%) of Twitter users who tweet such content. Additionally, about three-in-ten (28%) Facebook users comment on posts about government and politics and 43% “like” posts. On Twitter, only 13% of users reply to such tweets and 17% “favorite” them. Twitter users, on the other hand, are more apt to seek out political content directly from news organizations and political parties. Choosing to follow news organizations, reporters or commentators (by following, friending or liking a page) is more common on Twitter (46% of users) than Facebook (28%). The same is true, though to a lesser extent, when it comes to following political parties or candidates (30% on Twitter, 23% on Facebook), though issue-based groups are followed at the same rate (32%) on both services.